This case study involves a criminal prosecution in the NSW Land and Environment Court and subsequent appeal for illegal clearing of native vegetation. The clearing affected an ecologically significant wetland in the Murray-Darling catchment. Mr Hudson was charged with two offences under the Native Vegetation Act 2003 (NSW) (the Act) for clearing native vegetation on his 2,126 ha grazing property, known as “Yarrol”, about 60 kilometres west of Moree in northern NSW. The first charge was that he authorised the clearing of some 486 hectares of native vegetation otherwise than in accordance with a development consent or a property vegetation plan, contrary to s 12 of the Act. The clearing was alleged to have occurred between about 9 November 2006 and 5 March 2007. The second charge was that Mr Hudson failed to comply with a notice issued under subs 36(2) of the Act to provide information about the clearing. Mr Hudson pleaded not guilty to both charges. He raised several unusual defences such as the Act was void as being beyond the power of the Parliament because it effectively amounts to the acquisition on other than just terms of private property held in fee simple by Mr Hudson. There was undisputed evidence that earthmoving contractors were engaged by Mr Hudson and used bulldozers and chains to fell or uproot trees located on a large area of land within Yarrol. 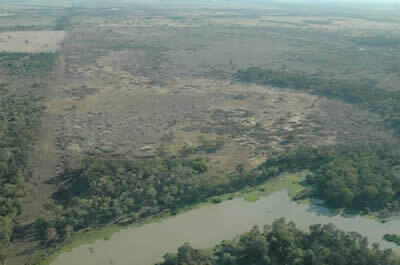 The prosecution showed through an analysis of aerial photographs that at some point between 10 October 2005 and 24 June 2007 almost all of the taller woody vegetation present upon an identified portion of Yarrol was pushed over. Mr Hudson was found guilty of both charges and fined $400,000 for the first offence and $8,000 for the second offence. He was also ordered to pay the prosecutor's costs. even-handedness in sentencing having regard to the general pattern of sentencing in cases which can be regarded as judicially relevant to the case at hand. Mr Hudson appealed to the NSW Court of Criminal Appeal, which refused his appeal against conviction but allowed his appeal against sentence on the basis that a lay-person who acted as his agent at the trial (Mr Walters) was "plainly inept" and "incapable" of properly representing him. The Court of Appeal considered that the trial judge "should at least had ensured that [Mr Hudson] knew that he was exposed to significant pecuniary penalties and of his right to make submissions and to adduce evidence in mitigation of the penalty." The Court of Appeal set aside the sentence imposed and remitted the matter to the Land and Environment Court for reconsideration of the sentence. Mr Hudson sought special leave to appeal to the High Court against his conviction on the basis that he was incompetently represented at the trial. The High Court refused to grant special leave to appeal against conviction on the basis that appellant could not have succeeded in his defence even if he had been competently represented. The rehearing of the sentencing remains pending in the Land and Environment Court. Note that the successful appeal against sentence does not affect the correctness of the principles to be applied in sentencing for environmental offences in the original sentencing decision. The appeal succeeded on a different basis. Summons (Class 5) for charge 1. Summons (Class 5) for charge 2. Map of Yarrol property showing location of clearing (1.2MB). Map of Yarrol property showing property boundaries and locations aerial photographs used as evidence in the trial were taken from (3.5MB). 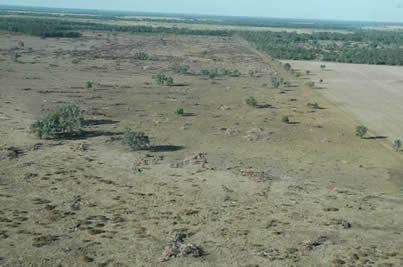 Aerial photographs of clearing on Yarrol property used as evidence in the trial. Judgment of Lloyd J in Director-General of the Department of Environment and Climate Change v Hudson  NSWLEC 4. Judgment of the Court of Criminal Appeal in Hudson v Director-General Department of Environment Climate Change and Water  NSWCCA 92. Transcript of special leave application to the High Court: Hudson v Director General, Department of Environment, Climate Change and Water  HCATrans 364. "Professor Richard Kingsford, who has spent years tracking the collapsing bird life in the Murray-Darling, believes the rookery on Yarrol was one of the most important breeding sites in the Gwydir. He is devastated. 'It is one of the worst examples where water management and native vegetation management went wrong,' he says." Ben Cubby, "Bulldozing wetland costs farmer $400,000" (The Land, 12 February 2009) reported on the decision in the case. While the judgment does not mention the Convention on Biological Diversity 1992, the legislation on which it is based embodies part of the Australian domestic legal response to the obligations imposed by the Convention. Enacted in the wake of the 1992 Earth Summit in Rio at which the Convention was negotiated, the Native Vegetation Act 1993 (NSW) forms part of a network of Australian domestic laws responding to it. These domestic laws attempt to conserve the habitat of threatened species and ecosystem function, in situ, as required by Article 8 of the Convention. Photographs tendered in evidence of clearing on Yarrol property. Court documents, photographs and maps courtesy of the NSW Department of Environment and Climate Change.